U.K. manufacturers intensified stockpiling last month as they prepared for Brexit. 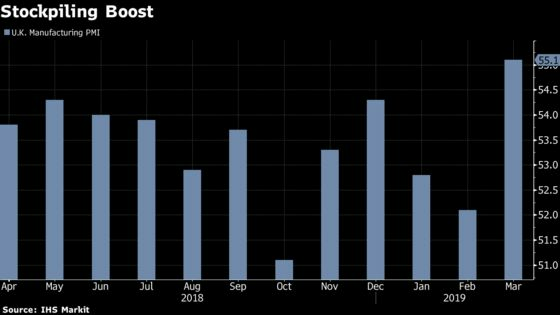 IHS Markit’s Purchasing Managers Index rose to 55.1 in March, the highest since February 2018, from 52.1 the previous month, the firm said on Monday. Inventories reached record levels, though optimism remained subdued. The delay to Britain’s departure from the European Union may prolong the uncertainty facing businesses. The lack of clarity has caused the economy to underperform its peers, losing nearly 2.5 percent of GDP relative to its pre-referendum growth path, according to estimates by Goldman Sachs Group Inc.
Research by economists Sven Jari Stehn, Silvia Ardagna and Andrew Benito found that uncertainty weighed on investment growth both in the aftermath of the referendum and more recently, with spending on “longer-lived” capital goods particularly affected. Companies surveyed by Markit said that future output will also be constrained when stockpiling unwinds. Output, new orders and stocks of purchases all surged. Employment showed expansion for the first time in three months. Nevertheless, the survey also showed signs that EU companies are switching away from U.K. suppliers. “The impact of Brexit preparations, and any missed opportunities and investments during this sustained period of uncertainty, will reverberate through the manufacturing sector for some time to come,” Dawson said.